The names of different wine bottle sizes might sound a bit strange, with most of the larger sizes named after Biblical kings. So, it's no wonder why the different sizes can be a bit confusing. 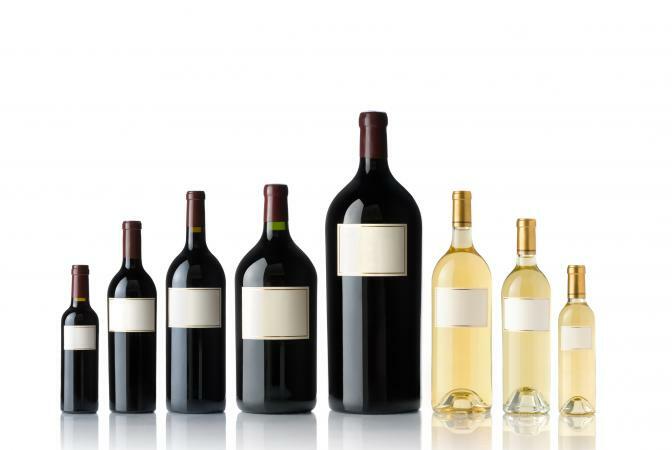 There are at least 16 different wine bottle sizes, beginning with the smallest, the Piccolo, and ending with the largest, which is the Maximus. While many bottle measurements are easily found and measured for height, it's difficult to get bottle sizing for the specialty bottles starting at the Melchior size. This bottle is a quarter of a standard 750 ml bottle of wine or 187.5 ml. Though you can find a few of the more expensive bottles of wine sold in quarters, this size is mostly used for Champagne and sparkling wine. These small bottles measure about 7-1/2 inches tall and 2-1/2 inches wide. A Demi or half bottle of wine holds 375 ml, which is one half of the standard 750 ml bottle. The bottle size dimension is 9-1/2 inches tall and 2-1/4 inches wide. The size of the bottle height ranges from 11-1/2 inches to 13 inches tall and about 3 inches wide across at the bottom. A magnum holds a liter and a half of wine (50 oz.) and is the equivalent of two standard bottles. Magnum bottles often have slightly different shapes based on the type of wine to be bottled, such as Champagne, Bordeaux, or Burgundy. Most bottles are about 14 inches tall and 4 inches wide at the base. The size dimensions of the magnum bottle vary slightly depending on the bottle contents. A Jeroboam bottle that holds sparkling wine is 3 liters (100 oz.) or four standard bottles. The size dimensions for this bottle are 18 inches tall and 5 inches wide. For a Jeroboam bottle that holds still wine, the contents are 4.5 liters (152 oz.) This volume equates to six standard or 750 ml. bottles. The size dimension of this Jeroboam bottle is 19-1/2 inches tall and 5 inches wide. This bottle has the same dimensions as a Jeroboam with still wine (four and a half liters of wine, or six standard bottles) and is primarily used for Champagne and sparkling wine. The size dimensions are 19-1/2 inches tall with a diameter of 5 inches. The next biggest bottle of wine is a Methuselah. This bottle holds six liters or about eight standard bottles of wine. A Methuselah bottle stands around 22 inches tall. This bottle is nine liters of volume (holding around 12 standard bottles). This bottle stands at just over 2 feet tall. A Balthazar bottle holds 12 liters of wine or 16 standard bottles. The bottle measures in at about 28 inches tall. This bottle holds a whopping 20 standard bottles of wine, or about 16 liters. A Nebuchadnezzar bottle averages around 31 inches tall. If you are trying to buy a Melchior bottle, then you may have to really search for this size which holds 18 liters (24 standard bottles). Because it is so rare to find this bottle, the size dimensions can't be confirmed but the height should be nearly 3 feet tall. A Solomon-sized bottle yields 20 liters, the equivalent of about 26 standard-sized bottles of wine. This is typically used for Champagne but the exact bottle dimensions are not available. 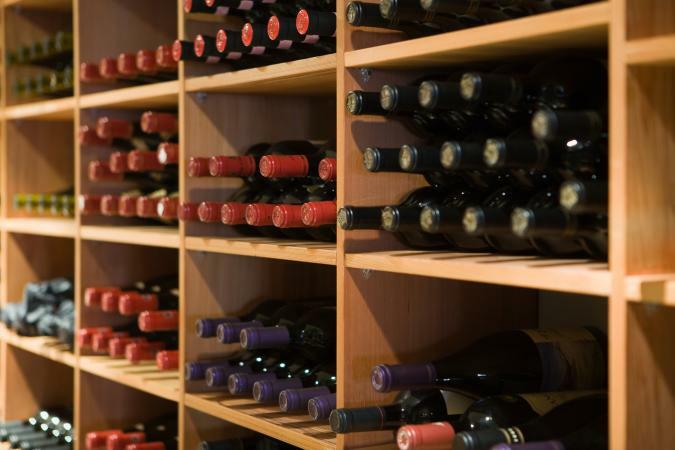 As wine bottles get bigger, they are used more for decorations or showpieces in wine cellars and restaurants. The sovereign-sized bottle contains approximately 25 liters or 33-1/3 standard-sized bottles of wine. Nearly the largest bottle of wine, it contains 27 liters or 36 bottles of wine in one gigantic bottle. It can hold either Champagne or Bordeaux. One of the biggest of them all, is the Melchizedek or Midas bottle. Some say this bottle truly exists, while others say it's pure myth. A Melchidezek bottle holds a staggering 30 liters of wine or 40 standard 750 ml bottles. Finally, the largest bottle holds 130 liters (184 standard bottles) and was created by Beringer Wine Company for a charity auction. It was recognized by the Guiness Book of World Records in 2004 for being the largest wine bottle created to that date. Finding the dimensions for the largest bottles of wine is nearly impossible simply because many of these wine bottle sizes are rarely made and just as rarely sold at your local wine merchant. After you get past a double magnum, the larger sized aren't sold very often and are used for rare special occasions such as launching a new ship. Additionally, it would be difficult to pick up and serve the wine out of a 36-liter bottle of wine. The large sized bottles are difficult to store and to maintain proper temperature control. Knowing bottle size is important as well as understanding the ideal serving standards for wine and Champagne of all sizes.